DJ Peters and Gavin Lux combined for 44 homers and 50 doubles this year. Each was playing his second full professional season. As the Dodgers brought Los Angeles its second straight National League pennant, six of their domestic affiliates reached the playoffs and three -- Double-A Tulsa, Class A Advanced Rancho Cucamonga and the Rookie-level Arizona League Dodgers -- took home championships. Winning in the Minor Leagues may not be the most important ingredient in development, but those rings must say something about the system. "I think it's a testament to both our scouting department and our coaching staff in [player development] that does a great job on a daily basis," Dodgers director of player development Brandon Gomes said. "We're following through on the vision the scouts see ... and it's a cohesive unit right now." Of course, behind every playoff-bound team are several terrific individual performances. The Dodgers saw their most highly touted youngsters -- Alex Verdugo (MLB.com's No. 32 overall prospect), Keibert Ruiz (No. 39), Dustin May (No. 71) and Gavin Lux (No. 82) make impacts while taking big steps developmentally. Catcher -- Connor Wong, Rancho Cucamonga (102 games): LA had a number of stellar performances by both veteran and up-and-coming backstops, but Wong's production (.269/.350/.480 with 20 doubles and 19 homers) demands the spotlight. "He had a great year, and we're even working on his swing a little and there's been progress during the instructional league so that he's going to cut down on strikeouts," Gomes said. "He's a really good athlete with a ton of twitch. When he gets those hands going, it's really impressive." Wong is new to the position, having converted from shortstop at the University of Houston. "He made tremendous progress receiving, blocking," Gomes said. "The arm is there, for sure. It's just about getting his pre-pitch movement consistent and just [getting] reps."
Honorable mention -- Keibert Ruiz turned 20 in late July yet had the fewest strikeouts per at-bat of all players in the Double-A Texas League, hitting .268/.328/.401 with 12 dingers while continuing to wow with his advanced skills behind the plate. In just about any other system, he'd have earned the top spot. Likewise can probably be said for Will Smith, while Rocky Gale was a key cog for Oklahoma City. First baseman -- Connor Joe, Tulsa (57 games), Oklahoma City (49 games): Acquired from Atlanta for future considerations in September 2017, Joe delivered his best season by far. Dodgers scouts believed his previous numbers were hampered by injuries, and the University of San Diego product came to the new system and delivered 46 extra-base hits and a .408 on-base percentage across the Minors' top two rungs. "He's a guy you want in the clubhouse on a daily basis," Gomes said. "He put the work in and he has tremendous quality at-bats each and every time. He's looking to do damage early and also caring about being a good hitter." Second baseman -- Rylan Bannon, Rancho Cucamonga (89 games), Bowie (32 games): Bannon left the system in mid-July, but what he did before his departure was enough to make him the California League MVP and Rookie of the Year, a midseason and end-of-season All-Star and a two-time Player of the Week. Yeah, it also was enough to make him a key component in the package that went to the Orioles for Manny Machado. His 20 dingers before the move east tied him for third in the Cal League on the season, and he had enough plate appearances to qualify his .402 OBP and .559 slugging percentage for the league lead. Third baseman -- Cristian Santana, Rancho Cucamonga (131 games): Santana, whose power is second among his tools to a cannon arm, led the Cal League -- and the system -- with 109 RBIs, shared the league lead with 24 homers and was second with 150 hits. Forty-two of those, including eight of his long balls, came in August, when he batted .369/.393/.643. "The last month of the season, this guy was totally unconscious. He's learning that at 90 percent, he can hit the ball 420 feet. Four-hundred-twenty and 450 both are home runs," Gomes said. "He tried a bunch of things we asked him to, and then he found his groove. He's an explosive hitter, elite power. You can't get a fastball by this guy." Although he committed 22 errors in 76 games at the hot corner (and eight in 42 games at first base), he has the makings of a solid defender. "He did great work with Petie Montero, our coordinator in Rancho who handles infielders," Gomes said. "All the tools are there. We're getting him to the point where he is going to start realizing that Cristian's 'good' is absolutely elite." 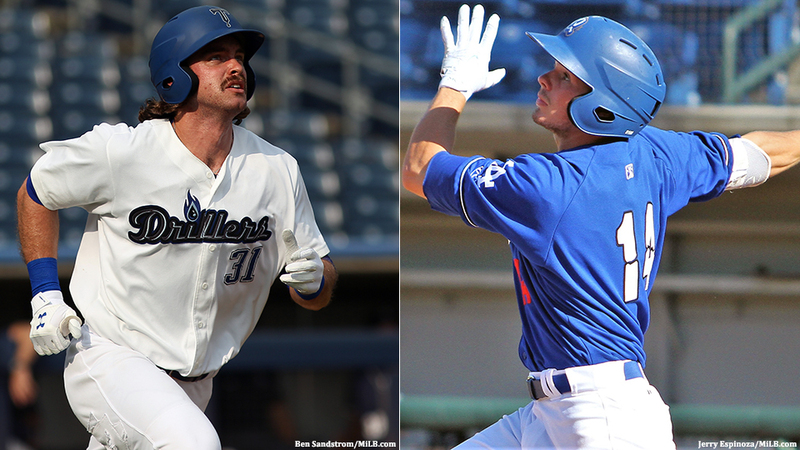 Shortstop -- Gavin Lux, Rancho Cucamonga (88 games), Tulsa (28 games): After a bumpy learning experience last season, the 20-year-old raked across two levels (15 homers, 27 doubles, .399 OBP) and went deep on the first pitch of the Drillers' championship clincher en route to Dodgers' Minor League Player of the Year honors. "Talk about the consistency. Gavin was as consistent as you can get -- he hit .324 at each level," Gomes said. "Our hitting coordinator, Aaron Bates, talks about taking away the mechanical side and then you can go play baseball. [Lux] did such great work on his swing over the offseason and added to his physicality, he could just go play baseball. He has ... a really advanced thought process for somebody his age and he has the ability to see strike-ball and puts in a tremendous amount of work defensively on a daily basis." The 2016 first-rounder also has an affable personality with leadership qualities. "It would be difficult to find somebody with better makeup than Gavin Lux," Gomes said. DJ Peters, Tulsa (132 games): A year after whacking 27 roundtrippers in the homer-happy Cal League, Peters belted 29 in the Texas League this season. That led all of Double-A ball as well as the Dodgers system, with the 22-year-old also pacing the Texas League with 232 total bases and tying for first with 55 extra-base hits. "He does everything we could ask him. He's here at Dodger Stadium, working out and hitting with our coaches," Gomes said. "Anything DJ does on the positive end is never going to be a surprise to anybody in [player development]. Nobody is more dedicated to his craft. The power is there, and he's continuing to simplify his movement and cover more of the strike zone and more pitches." While his 192 strikeouts were most in the Texas League, he put up a .320 OBP in his first prolonged look at upper-level pitching. "I thought he did well. He showed he can grind out a high quality at-bat. He takes his walks," Gomes said. "If a player has success early on and [doesn't hit] .330, 30 homers, 100 RBIs, it's easy to nitpick. ... [On defense], he showed a strong ability to stay in center field and we already knew he could play the corners. This guy is going to go out there and do everything he can; he's going to squeeze the very last drop out of his talent." Alex Verdugo, Oklahoma City (91 games), Los Angeles (37 games): This marks Verdugo's fourth Organization All-Star nod in five pro seasons, and why not? The 2014 first-rounder led full-season Dodgers players with a .329 average, which was fourth in the Pacific Coast League. And his 70-grade arm helped him record nine assists. Verdugo, who turned 22 on Sept. 1, doesn't have much left to prove in the Minors, but that also was true at the beginning of the season. His patience and consistency earned him three stints in the big leagues, over which he batted .260/.329/.377 in 37 games. Cody Thomas, Rancho Cucamonga (127 games): After batting .222 in his first full season last year, Thomas led the Cal League with 248 total bases while ranking second with 61 extra-base hits, 87 RBIs and 82 runs scored and putting up a .285/.355/.497 slash line. "He went and worked extremely hard with [Quakes hitting coach] Justin Viele to develop a strong routine before games," Gomes said. "He worked with the velo machine and did different drills to get his swing ready. Whether that's just [about] confidence ... he was making sure he was ready to fire his 'A' swing during games." Utility player -- Drew Jackson -- Tulsa, (103 games): Primarily a second baseman, Jackson can be plugged all over the field. Wherever he plays defensively, he's dangerous on offense. He posted a .356 OBP with 15 homers, 20 doubles and 22 thefts for the Drillers. Despite strong final numbers, Jackson's power didn't really show up until the second half. "I think Drew actually just started off a little slow in Spring Training, banged up a little bit, and as he got stronger and healthier he was a lot of fun to watch," Gomes said. "He was [also] continuing on the path of his minor swing adjustments that he implemented over the offseason into the year and then getting the reps he needed to see that play through." Honorable mention -- Omar Estevez: One level down, Estevez bounced between the middle infield positions while leading the Cal League with 43 doubles and 87 runs scored. Right-handed starter -- Tony Gonsolin, Rancho Cucamonga (17 starts), Tulsa (nine starts): Last offseason, the player development department decided to move Gonsolin and his four pitches from the bullpen into the rotation. The result? Dodgers Minor League Pitcher of the Years honors after going 10-2 with a system-best 2.60 ERA and 155 strikeouts. "The most impressive thing was the way he was able to carry two, three innings over to five, six, seven innings as a starter," Gomes said. "That was really beneficial to his development. He has an improved slider -- it was already good -- and his consistency ticked up. He has a split-change that he could roll out of bed and throw for strikes or below the zone for a swing and miss." Left-handed starter -- Leo Crawford, Great Lakes (14 games, nine starts), Rancho Cucamonga (13 games, 11 starts), Oklahoma City (one game): Everything fell into place for Crawford in his second full season -- especially from July onward. "He was starting to trust how good his changeup was and that he could throw it left-on-left," Gomes said. "[Quakes pitching coach] Connor McGuiness flagged that for him: 'This is an above-average pitch. ... You don't have to go with only throwing it to righties just because that's what the convention is." A strike-thrower, Crawford went 8-6 with a 3.50 ERA. "Leo pounds the zone. ... He'll quick-pitch guys or pause his delivery. He's a guy who's not afraid to go after you. The fastball isn't overpowering by any means, but he has good command and goes out there and competes as much as anybody in the organization." Relief pitcher -- Brian Schlitter, Oklahoma City (58 games): Signed in February and returned to free agency at season's end, Schlitter led the system with 21 saves, good for second in the PCL. The 32-year-old right-hander was unscored upon in 40 of his 58 appearances and yielded a total of four runs over 18 1/3 innings across 12 appearances in June. On the whole, he was 7-2 with a 3.36 ERA.